I found this at Badass Digest and felt it needed to be shared by readers of my blog. I saw this with my friend Dan Hasegawa on opening weekend and the next weekend, I took my wife. Both of them enjoyed it nearly as much as I did, and that says something because they do not have very similar taste. From your opening moments, you know that something about this movie is just different. The music is a little different, and the lighting of the film seems natural but maybe a little over saturated at times. There is nothing particularly distinctive about the camera work, if feels flat and static for most of the movie. When we get a chance to see anything that could charitably be described as a “special effect”, it is so basic and down to earth it is hard to imagine. 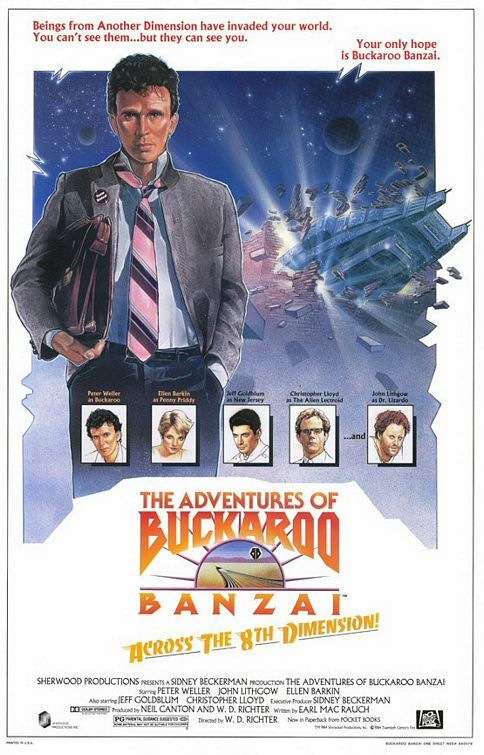 Compared to all the CGI effects that you see in even the cheapest of movies today, Buckaroo looks primitive, and that is one of the reasons it is loved by those of us who drink the Kool Aid for this movie. The flying saucers of the aliens seem to be sea shells, and the internal layout of both Buckaroos campus and Yoyodyne Propulsion, the headquarters for the rouge Red Lectroids, appear to be an endless series of hallways and tunnels, most of which were likely part of a DWP facility in the Valley. Duct tape and heating and cooling conduit pipes are used to make the environment otherworldly. The set decorator for this movie must have had a budget equal to an early episode of Trading Spaces. So if the movie is shot in a non-dynamic manner, and the effects are chintzy, and the music is off, what is the attraction? THE SCRIPT!!!. 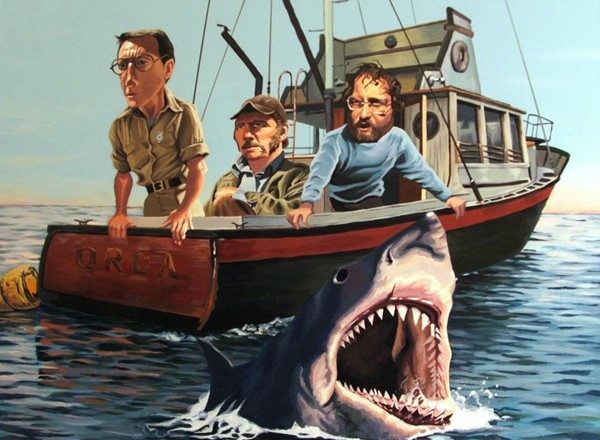 This is one of the most logically off the wall concepts ever committed to film. The dialogue is a hoot and it is filled with memorable one sentence jokes and comments that stick in your head for no particular reason. “It’s not my goddamn planet. Understand, monkey boy?”, who writes stuff like that? “Lithium is no longer available on credit.” Someone was warped and saw that if you can get people to pay attention to the actors and the dialogue, the crappy sets don’t really matter. There was no way they were going to compete with the sci-fy extravaganzas of the day. Even the Star Trek Movies which were done on modest budgets were going to make this look like a weak attempt, so they shoot off in a different direction altogether. These are not visitors not just from another planet but from another dimension. Their presence here was covered up by Orson Wells with the “War of the Worlds” broadcast. Buckaroo is a neurosurgeon, zen master, rock star with his own fan clubs and comic books. The movie seems to be one of a series of stories that have been told with these characters and they are just dropped whole into the story without much background. Peter Weller is so dry, you could pour water on him and steam would come up. His delivery rarely sounds stressed or excited. Everyone else is over the top and playing with stereotypes. Oh, and speaking of over the top, this movie has the greatest mad scientist, evil villain, John Lithgow performance ever. His look is insane, his accent is ridiculous, and his eyes will haunt you with how crazy good he can be with his facial expressions. I was laughing every time he was on screen. He says some of the most arcane insults and orders to everyone around in such a way that he cant help being the center of attention. He chews the scenery, then does a handstand and waves his arms over his head to say “Look at me!”. And he sells every single minute of it. This was a comic performance for the ages. Credit the dialogue, make up and costumes, but don’t ever forget the actor who was possessed by Lord John Whorfin. 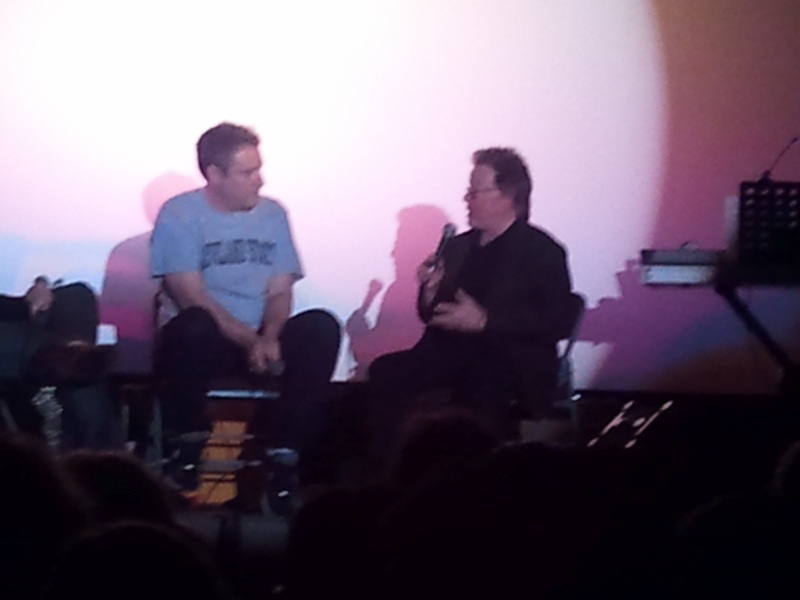 The event we attended was also a live podcast featuring stand-up and quick-draw improv comic Greg Proops. I found his material before the show to be very entertaining although he wanders off on tangents so often that it would be easy to lose interest. After the movie he riffed on the film even more, however it did take a negative political turn and you could feel the wind come out of his sails. No matter how much louder he got or how emphatic his language was, he strayed away from the funny over to the political at a substantial cost to the audience and the event. The event was not up yet but it should appear at his site on i tunes “The Smartest Man in the World” . Lots of F-bombs and a load of bombast toward the end, but 80% entertaining. After the disappointment of last years Cars 2, Pixar comes back with a fresh story and a return to their high standards of movie making. “Brave” easily avoids the missteps of the last Pixar picture, and creates a series of instantly recognizable characters to populate the world that they are exploring in the new story. This is the first time that Pixar has strayed into traditional Disney territory. There is a story focusing on a Princess, there are enchantments gone wrong and witches and will-o-wisps and all sorts of anthropomorphic animals. In a twist, Disney’s “Tangled”,from a couple of years ago, is a much more free spirited and Pixar-like movie and “Brave” could much more easily sit on the shelf next to “Pocahontas”, “Cinderella” or “Beauty and the Beast”. The movie is simply gorgeous from the start. Scotland as a setting give a wide latitude for scenery, including lakes and forest and mountains and snow covered peaks. These images are all lushly rendered with the attention that you would expect from the perfectionists at Pixar. The movie was created for a 3D presentation, and we only saw it in a 2D format. There were a few spots where it seemed to me that the image was fuzzy because we were not using the polarized glasses. Most of these segments were establishing shots of canyons and landscapes that in a traditionally filmed movie would have been done with helicopters. In computer animation, it is hard to figure how this might go wrong and I think it is simply that the detail is so thick that if you are not seeing it in 3D it blends together a little faster than you would want. I only noticed this effect a couple of times in the movie, but instead of irritating me, I simply want to return and see it in the other format. The characters are also designed so that we can relate to them immediately. Merida, the heroine of the story, is easy to understand. She is a beloved first born of an impetuous King and his wiser wife. She has the fiery personality of any Scottish maiden combined with the stereotypes of red headed women. Her Mother and Father are voice by actors who we are familiar with, and convey the right attitude toward her within just a few seconds. Her young brothers do not speak but are clearly set up as impish offspring with fearless personalities and ultimately good hearts. For the first act, we get a very traditional set up of royal family conflict. A teenage daughter chaffs under the expectations of her parents. Her fearless personality and great athletic skills dwarf the potential suitors that have arrived to make a politically expedient marriage. The vast majority of the first act is given away in early trailers, so anyone going in has a clear expectation about how the story is going to develop. Where things change in a pretty innovative manner is in the second act. In a moment of frustration she makes a deal with a witch that goes completely in a different direction than is traditional. This is not simply “The Little Mermaid” revisited. I won’t say how things turn out, but I will say that it all fits with what was set up in the first act and it creates a very emotional resolution at the end of the third act. I don’t know that I was always satisfied with the turn of events. The “magic” element seemed to me to be something that needed a little more set up in that first act. I did not think there was anything wrong with it, but it felt somewhat abbreviated to me. The best element of the movie is the heroine’s story arc. She is willful and headstrong and certainly has difficulty seeing her Mother’s point of view. The way events unfold allow her to understand her Mother a lot more clearly and in a way that seems realistic. Merida never stops being who she is, but she does become something more than she was. In the third act there are moments of heroism and contrition. I thought the traditional race against the sun rise was cliched, but it still works every time. There were some rather risque bits of visual humor and innuendo that might be a little over the edge for very small children, but I did not think any of it was offensive and most of it fit with the primitive Scottish setting that the story takes place in. The main conflict of selecting a spouse is handled in a different way than traditional Disney fare. There is no handsome prince that rises to the occasion and resolves things with a smile that turns our heroine’s knees to jelly and finishes off the story. Instead we are left hanging on what may yet come. The path that brings us to that point is an honest one and I don’t feel cheated by the ambiguity of the outcome. From a technical point of view the most is top notch. The story is well worn but has some major modifications to it that allow it to feel very distinctive. I think the Scottish setting added a good deal to the humor of the movie as well as the look. Once again, Pixar shows us how character and story are the keys to a good film. This film should have a broad audience, but I do fear the usual resistance of little boys to a story that features a girl at it’s center. If Madagascar 3 ends up being more successful, be assured it it not due to quality but rather the fickle nature of an audience for films aimed at children. By the way, stick with the movie through the credits, there is a brief stinger which should get a good laugh and is worth the three minutes of your time to get to. 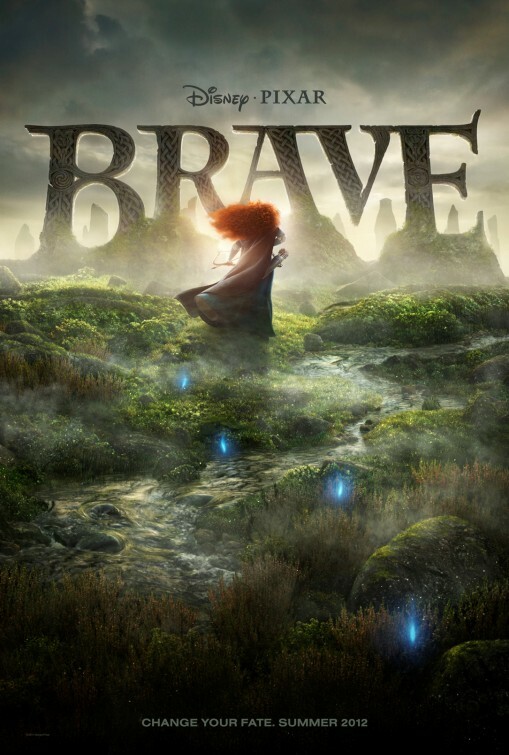 Brave is preceded by another fantastic Pixar short. It is a lesson in story telling using no dialogue at all. We understand the characters and their points of view and function simply by observing their actions and appearance. Within a five minute span, we are introduced to three character, a whimsical setting and a nice morality tale on individualism. I love that Disney and Pixar have committed to animated shorts being part of the movie going experience. It gives added value to the memory and the heart. 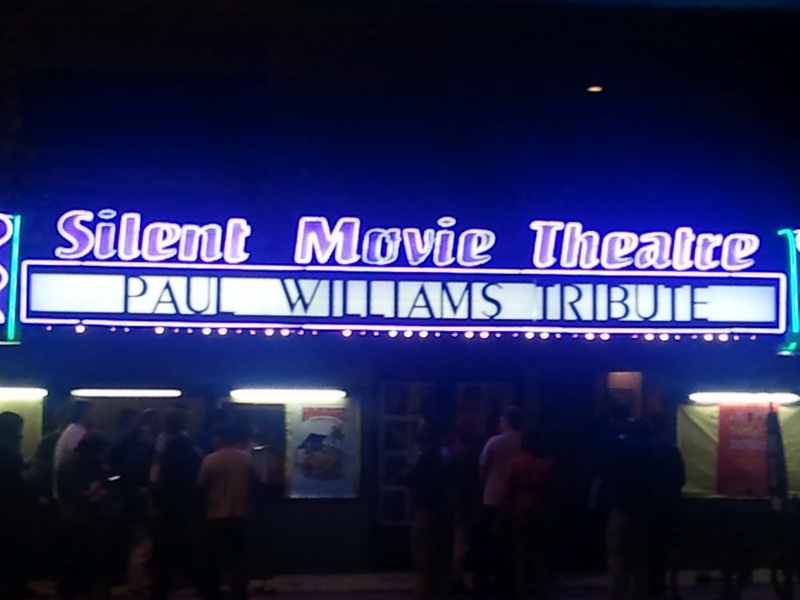 This is the follow up to last weeks post on the Paul Williams event, tonight we saw the documentary film itself. 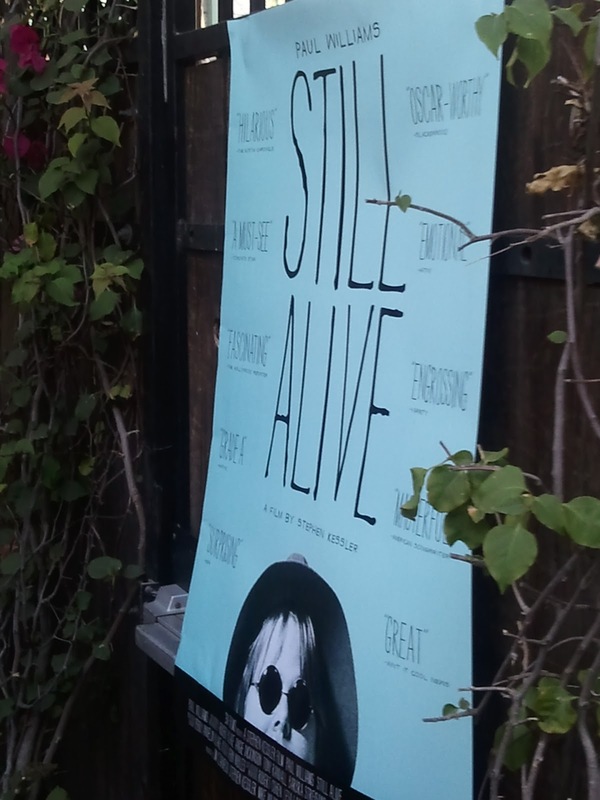 The film is playing at the Nuart this week and depending on it’s success will find more venues around the country. The screening we went to was sold out but that may be because the director and the subject were both appearing after the movie. There was another Q and A session and some of the same issues were discussed that were covered the week before, although it was less intimate and the time was much shorter. Here I want to focus on the film itself, rather than just the event. I have seen enough documentaries in my lifetime to be able to recognize their formats and styles. In the last twenty years, film makers have dramatically changed the way they choose to present their subjects in these kinds of films. Michael Moore and Morgan Spurlock have inserted themselves into their films as a way to tell their stories. Each of them has outsized personalities and egos that tend to serve their story telling skills quite well. 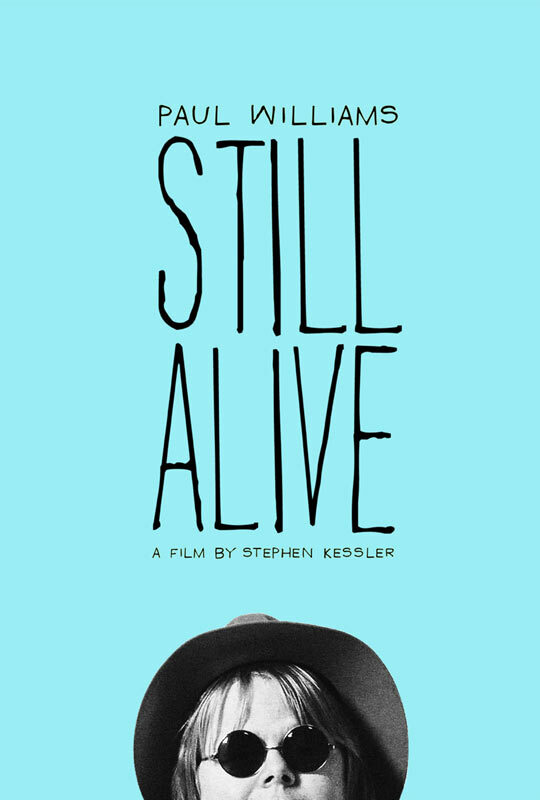 The Director of “Paul Williams Still Alive” is Stephen Kessler, and he is following in the path blazed by those other two. Kessler though is not a willing “star” of his own feature however. He became a screen presence largely because he had a very resistant subject and a theme that was not going in the manner that a traditional film of this ilk would take. While Paul Williams is the subject of the film, and his career trajectory and celebrity descent are a part of the story, they are not the focus. This is not a story in the MTV style of “Where are they Now?”. Paul Williams it seems is not suffering from a lack of being the center of attention that he was for such a long time in the 70s and 80s. He has changed in ways that will probably seem odd to our fame obsessed, celebrity driven culture. While he may have been one of the founders of that culture, he has come out the other side a wiser and more satisfied human being. Kessler pursued Williams to make the movie and Williams was largely indifferent. Even after he was given permission to film, Williams was uncomfortable being observed so closely, and self conscious of the camera and film maker. There were several years of contact and filming that went on before it strikes each of them how awkwardly the process was going. It is not until Paul directly confronts the elephant in the room that the story finally starts to take shape. Paul confronts Kessler and basically puts the director in the film as a central character. Instead of a movie about the life of Paul Williams, we get a mediation on the expectations of the director on his subject and on the way his biases are challenged by Williams. For instance, there is one sequence in which Kessler rides with Williams and his wife Marina to a gig in Las Vegas. There are some awkward moments between the three of them over mundane things like where to stop for lunch. She is acting as his manager for the weekend and is shown in what might be an unflattering and unprofessional few moments trying to clear up band comps for the shows while the band is trying to rehearse. Sure the musicians got annoyed, because they were working at the moment and she interrupted them in a seemingly unconscious manner. But guess what, the show went on and there was no other big tension during the performances except for the directors intrusiveness. It is an incident in a professional career, it is not a story indicative of that career. Later on, there is a long trip to a dangerous part of the Philippines. The director is expecting the worst but for the most part Williams just plays the complications as they come up and he is unruffled by minor inconveniences. There is no diva here to focus on and again, the directors expectations become the story rather than the actions of his subject. Kessler seems to be a nice guy who was moved to this subject matter by a sincere admiration for the song writing skills of his subject. Once he encounters his subject and wrestles with the difficulty of pinning him down for the traditional show and tell of a celebrity film, he realizes that his own voice needs to be a part of the movie. Because the opening section of the movie focuses on his connection to Paul Williams as a kid, the average viewer might think this is a little narcissistic. I suspect that this became the opening of the film only after Kessler saw where his material was taking him. He does give a brief list of his bonafides, but he does not dwell on himself. He is as a reluctant a focus of the film as Williams was, and this is one of the charms of the story that is told here. The end result is a film that explores intimacy in a celebrity show it all world. Brittany Spears flashing her whohah for paparazzi is not intimacy. Getting someone to reveal a moment from their past might be a moment of intimacy, but seeing how another persons mind works and how emotions are not always easily manufactured to me are real moments of intimacy. This film manages to do this although not in the way you would have expected. 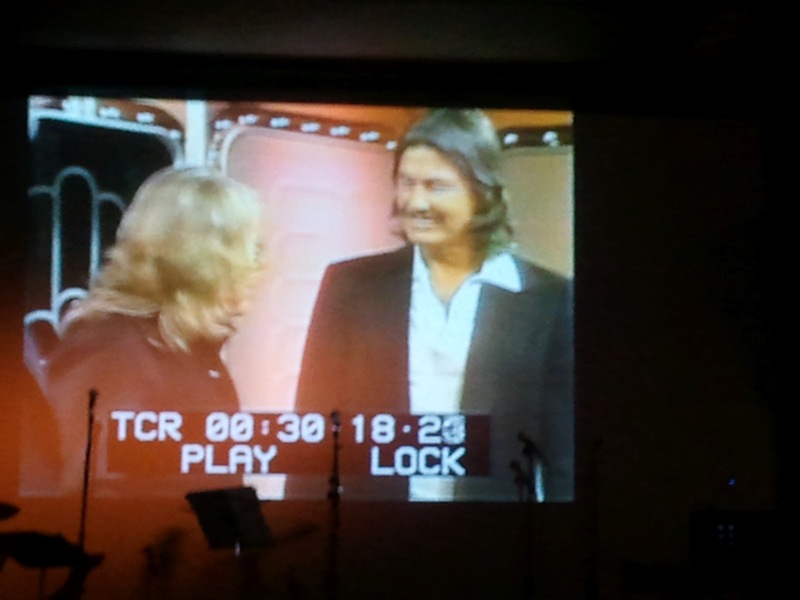 We do get to see archival footage of Williams on all those TV shows he did. Sometimes we get brief moments of pleasure at hearing his distinctive voice turn some of those phrases in his lyrics into moments of sublime brilliance. There are also the embarrassing, over the top moments that make us pause and think to ourselves, “why would he ever do that?” Williams alcoholism and drug abuse are part of the story, and at times it seems that is the focus that Paul himself wants to spin for this film. While his recovery is central to his life and a part of the film, this is not where we linger. The truth is Paul Williams is as clever and talented as he was forty years ago. The difference is that he is not as needy. He is both celebrity and everyman. Signing autographs for fans and being cheered on stage, but also eating squid at a nondescript Asian restaurant and carrying his own luggage when he travels. 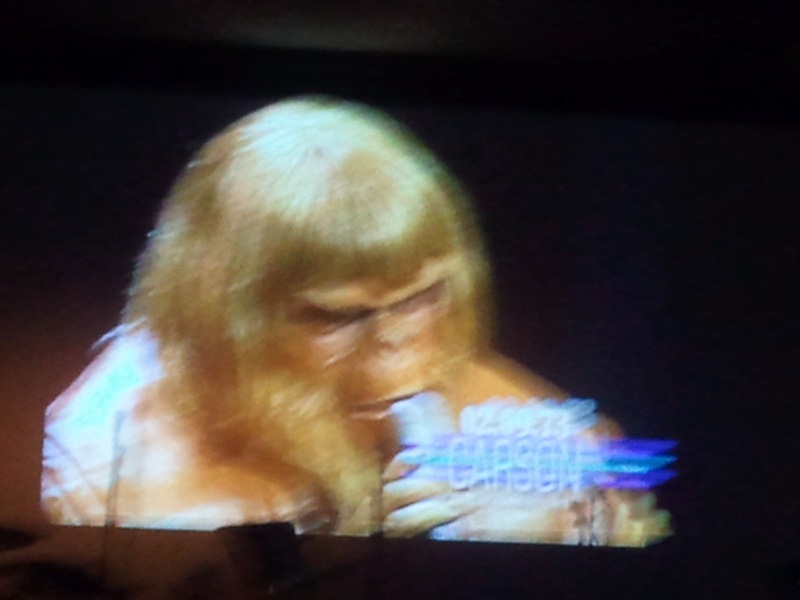 When he is confronted by an embarrassing, drug fueled, grandstanding clip of himself hosting Merv Griffin’s show, the current Paul Williams is mortified. Here is where we really get to know him. Someone in the movie put it well, I can’t remember if it was Kessler or Williams, but it seems that Kessler wanted to look back, whereas Williams wants to look forward. The achievement of the film is that it succeeds in doing both of these things at the same time. Both the film maker and the subject have aspects of themselves that are unflattering, revealed for us on the screen. They also have moments of warmth and honesty and success as the movie comes together. The coda of the film reminds us that Williams has been sober for twenty years, that he has been a certified drug counselor for sixteen years, and that he is has been President of ASCAP, the most important musicians rights organization since 2009. All of those things are important accomplishments, but to me the most important thing the movie showed me was that Paul Williams has become a person that he would not be embarrassed to introduce to his own kids. So there are two reasons to see this movie. Both of those reasons appear to be controversial in the first place, so just ask yourself how you feel about music from the 80s and Tom Cruise? If you don’t care for at least one of them, you have no reason to be sitting in the theater. If both of them work for you, then there might be a reason to see the film but it might not be a strong enough reason to pull you in if there are other reservations. There is lots to see and listen to here, but most of it is innocuous fluff that would not be missed by fans of either Cruise or pop music from the 1980s. I did not count all the songs, I’m sure somewhere on line that information is available. I was impressed with the number of songs and the frequency with which I recalled them fondly. They were not particularly obscure titles, but the shelf life on some of them was short in the beginning so they will be unfamiliar to anyone who has not grown up listening to oldies and classic rock. The performances of the songs cover a wide range, like one of those theme nights on American Idol. There are some standouts, usually done in a traditional manner on stage. There are some clunkers, usually used for exposition where the most tangential connection to the thin story is used to justify it’s placement in the film. Finally, and most frequently there are middling versions of mediocre songs that will not be remembered five minutes after the movie is done. Sometimes those moments were briefly fun, frequently they were embarrassing. Tom Cruise acquits himself pretty well in the singing segments. He has enough of a voice and enough electronic assistance, that you can accept he is a “Rock God” in an 80s hairband. The more successful aspects of his performance encompass the characterization he makes of a “Rock God” living the lifestyle. He spouts the most irrelevant comments and nonsensical responses you can imagine, but they come across organically. He carries off the brain-addled, over pampered, narcissist with ease. You will not doubt that Stacee Jaxx is a star modeled on some of the big names of the day. He could party with those people and fit in without a second glance. He and Malin Ackerman share one of the best scenes in the film, and both play it for comic impact. She goes straight for the laughs and he stays in character, giving the line readings and expressions that make the scene funny. The love story between the young leads of the film is fine, but it is so predictable that it makes it even more clear how much was being forced together to get some narrative out of the story. The movie is a big goof to begin with, so if you don’t see the humor in this when you are going in, it will probably irritated you coming out. 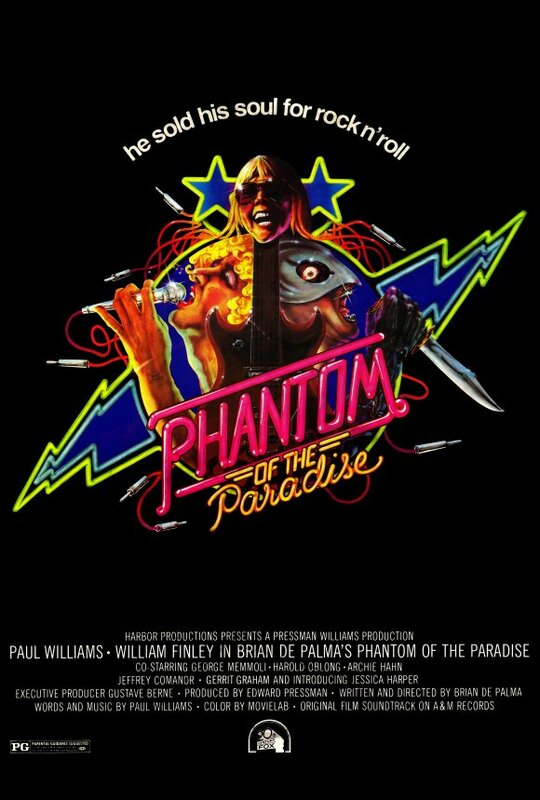 I can accept the goof on the idea of this being a cliche ridden patchwork rock fable filled with cheesy 80’s songs and over the top drama. I’ll bet on stage, with an audience of theater lovers it works like gangbusters. Here, I don’t think it works so well. In my head I kept seeing this as an extended episode of “Glee”, only without the gay subtext. Imagine my chagrin when the gay subtext shows up, out of the blue and completes the concept as an elaborately staged episode from that TV series. As a hit or miss pop jukebox, video retrospective, it works fine, but as a story it is simply limp. There are several performers who show up and mostly miss having any impact. Bryan Cranston is wasted, unless you think seeing him spanked in his underwear would be funny. Catherine Zeta Jones, does her best singing and dancing, and she is competent in both. The problem she has, is the part is thankless and dumb headed and plays to the worst cliches of a youth audience, about anyone who might think the music or lifestyles of these people are questionable. Paul Giamatti plays sleazy without having to think to hard, and so he doesn’t. We are at least spared him crooning a full song. Unfortunately the same cannot be said about Alec Baldwin, who not only sings once, he sings twice, and one of the songs is the strangest romantic duets imaginable. It was good for one brief laugh. Russel Brand and Mary J. Blige show up, sing or act their parts and move on with the careers intact, but not much to show talent wise in this movie. 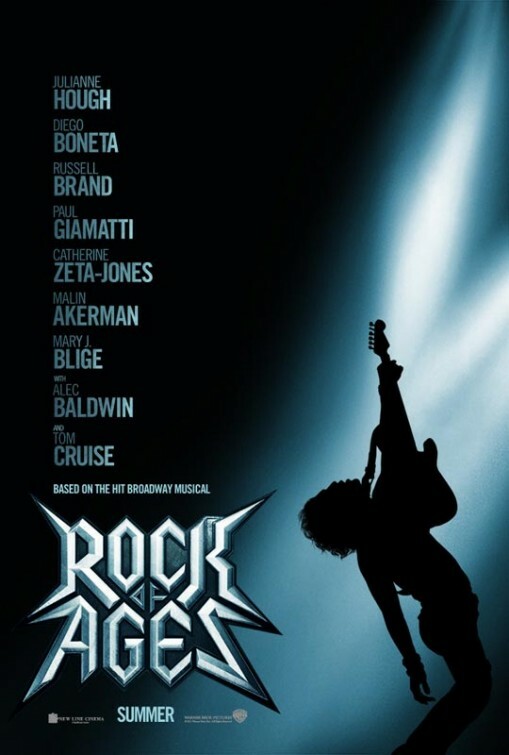 “Rock of Ages” is made for people who like theatrical musicals but are too lazy or poor to go out and see one on stage. It feels like a nice little revue that could be a bit shorter, a bit funnier, and a bit more memorable. I can imagine a lot of people hating it from the get go, a few people loving it for what it is, and almost everybody else who does see it, yawning indifferently and rendering a judgement of “meh”. Tom Cruise almost makes it worth seeing, but that word …almost…is really important to pay attention to. If you can live without being a completest on Tom’s works, then you can probably live quite happily, just putting in an old CD and listening to the original versions of the music.